Intel has actually created three separate generations of floating-point hardware for the x86. They started with a rather hideous stack-oriented FPU modeled after a pocket calculator in the early 1980's, started over again with a register-based version called SSE in the 1990's, and have just recently created a three-input extension of SSE called AVX. Generation 1: "FPU Register Stack"
Almost uniquely, you don't specify registers for most operations: instead, the values come from the top of the "floating point register stack". So "faddp" (add and pop) takes two parameters off the stack, and pushes the resulting value. The reason they did this is because they *had* to: they weren't willing to use enough bits to specify two separate register numbers. A few instructions include enough bits to specify something other than the top two registers, but usually one value must be on top of the stack. The FPU register stack was introduced with the 8087 math coprocessor. 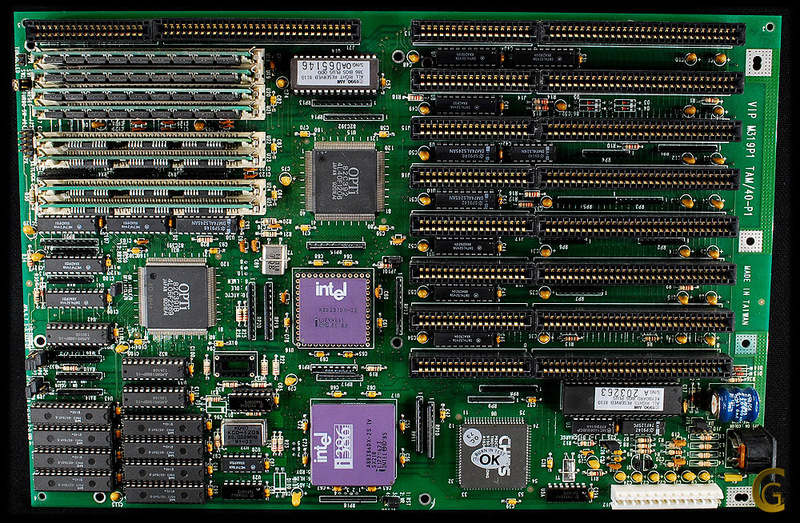 It got pretty popular around the 386 era, when you needed to add a separate 387 chip to the motherboard to get floating point instructions. Floating point was integrated into the main CPU around the 486 era, with the 486DX including on-chip floating point. Internally, there are 8 floating point registers (pushing too many values into those registers makes floating point operations stop working). The registers are each an 80 bit "long double" (sign bit, 15 bit exponent, and 64 bit mantissa). 80 bits is a really weird size; one of the only hardware-supported data types that's not a power of two. I've seen machines that store those 80 bits using 10 bytes of memory (no padding), 12 bytes of memory (padding to 4-byte multiple), or even 16 bytes of memory (padding to 16-byte multiple). On old 32-bit machines, the typical way to return a floating point value from a function was to leave it on the floating-point register stack. Here's a similar operation in assembly. Because I move the resulting value to memory myself, this runs in 64-bit mode. This implementation worked reasonably OK for many years, but the restriction that you can only operate on the top of the stack makes it cumbersome for compilers to generate the code for big arithmetic intensive functions--lots of instructions are spent shuffling values around in the stack rather than doing work. A brand new set of registers, xmm0 through xmm15. They're all scratch registers. A brand new set of instructions, like "movss" and "addss". Here's a typical use; see previous lectures for the gory details. Today, SSE is the typical way to do floating point work. Some older compilers might still use the FPU (to work with very old pre-SSE hardware), and the very latest cutting edge machines can use AVX, but this is the mainstream typical version you should probably use for your homeworks. Most other modern CPUs have "three operand instructions": X=Y+Z is a single instruction. Note that SSE still uses "two operation instructions", so X+=Y is a single instruction. The very latest 2011 x86 instruction set addition AVX changes that: you can now write three-operand instructions! There are a few other additions, such as a new set of "ymm" registers with wider vector parallelism, but for scalar code the big change is three operand inputs. The only downside with AVX is that if your processor was built before 2011, it won't run those instructions!